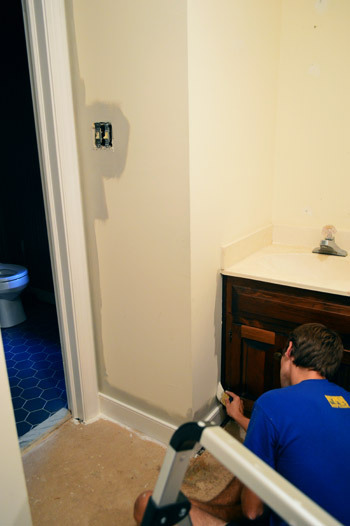 We were trapped inside for the last few days due to rain, so we made some progress by tackling the job of painting our recently de-carpeted master bath & closet. Here’s a shot of what we eventually got the space to look like, complete with stenciled floor, and – what we’re talking about today – Benjamin Moore’s Revere Pewter on the walls. But let’s rewind for a second. First up was painting the cream trim white (we went with Simply White in semi-gloss, just like the trim in the rest of the house). 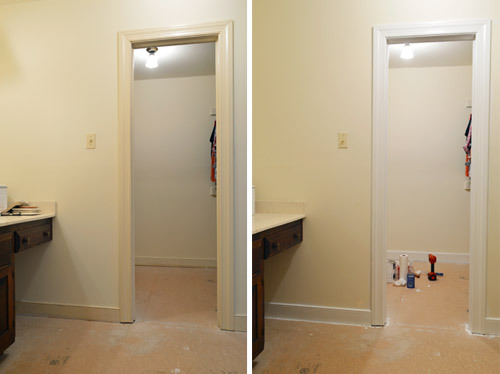 Part of me hates to downplay the time that task took by sharing one measly before & after picture to cover that step. It took one coat of primer and two coats of paint (all applied with a brush) and both Sherry and I got in on the action. I primed since that’s not VOC-free like the painting part, and then when that coat dried we both worked our way around the room’s copious doorways and little areas of baseboard with the paint. Then the cutting in part of the wall-painting process came along and made the trim-work look like child’s play. So. Many. Angles. Please allow me to demonstrate with the panoramic function on my iPhone. I’m not usually one to complain about painting (except for painting ceilings, in which case I will whine for days) but painting walls is usually “the fun part” for us. However (here comes the BUT!) I think whenever you go into any project thinking “this’ll be fast and easy” it’s a slippery slope. And after 6+ years of DIYing we should have know better, so it’s no ones fault but our own. But this was totally one of those tiny areas (seriously, the whole thing is probably around 80 square feet) that had us feeling cocky and saying “let’s just bang this out in an hour or two” and it ended up taking a few 2-hour installments over a couple of days. Womp-womp. But it’s done! Praise those sweet, unpredictable DIY Gods, it’s done. You might remember that we tossed out this “Percolating In Progress” post with a few first thoughts on paint colors right after we moved in. For the master bathroom and our walk in closet we wanted something somewhat light (there aren’t any windows in either of those spaces) but not too light that it washed out things like the white trim, white mirror, and the white shelving in the closet. At first we debated Pismo Dunes and Gray Owl (both below) but we ended up liking the Revere Pewter swatch better, which is sort of a combination of both of them. It’s almost like a darker tone of Edgecomb Gray (less brown than Pismo Dunes and a little richer and less gray than Gray Owl). We really liked the way it dried. Taupe-y in some lights (like this shot). Gray-ish in others (like the one below this one). It changes throughout the day, and works really nicely with the deep faded blue-gray color (Black Pepper) in our bedroom. The rolling was pretty easy by comparison to the edging. Oh and we chose to paint the ceiling the same color as the walls in here. We’ve learned in small spaces it actually makes the room feel less cramped when the ceiling and the walls are the same tone (assuming it’s not too dark of a color) since it just makes an angular/choppy/cramped space feel less broken up and boxed in. And just like the other rooms we’ve painted, after all the paint was dry, I used this as an opportunity to switch out all of the light switches and outlets from the old cream versions to clean white ones. This photo is a bit darker (hello black hole closet) because I had the power off, but it actually demonstrates how the wall color sort of chameleons itself in different lighting situations. Even with the lights on, the darker color on the walls is a nice backdrop to help show off the mirror’s shape (and all of that trim that we painted pops nicely too). We still have a ton of other things to attend to in here, but here’s a little side-by-side comparison of where we started (well, once carpet was up) to where we are now. With the walls painted, we can now get jiggy with the floor (I don’t think I’m using that right) which is the part we’re most excited for because, well, it’s the most unattractive at the moment. And since the sunroom grout situation is still looking a little bleak (throw us a bone, Mother Nature!) all signs are pointing towards this floor getting done before we can finish the tile-job outside. 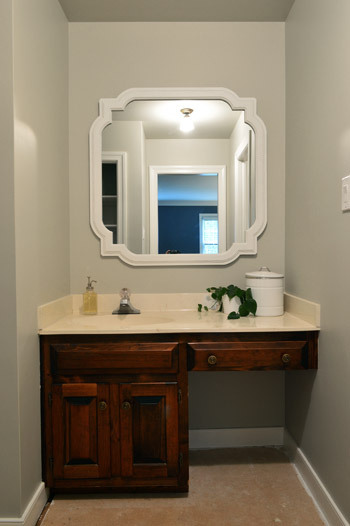 … so now we’re thinking that a two-toned stencil on the floor and a more subdued color on the vanity might play better with the sinktop tone without robbing the room of any excitement (instead of adding interest to the vanity we’ll just shift the attention to the floor). Sort of like how a darker tone on the vanity in our half bathroom downstairs neutralized the same yellow-toned sink – and then we can add art and accessories for more color, interest, and to balance things out so the room makes sense in real life (photoshopped renderings aren’t always the perfect real-life representation). Fab Freebie: On Your Mark, Get Set, Sew! This is the color in my living room, and it always looks taupe-y. I’m amazed at how gray your is! Looks great! Speaking of giving a mouse or a house a cookie, I finished up the edible (cookie) fall garland this weekend..
Just in time for a let’s-chain-saw-the-back-yard festival. Silly (but serious) question, is there ever a “true” day off for those who work from home? We’ve decided to implement Rest Hours (a la Family Nap Time) but I’m not sure how successful that concept will be. That’s a smart concept! We try to take a Sunday off every once in a while and just rest, do fun family stuff, and even go out with friends or see a movie or something if we can. Definitely gets you recharged again I think! And I love your fall garland! 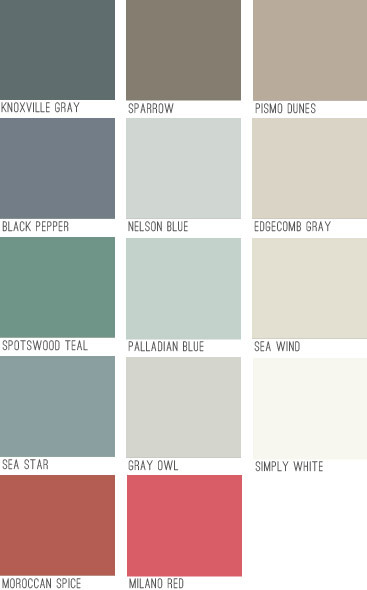 I’ve been in a quandary trying to decide on a paint color for my master bedroom . . . and I think Revere Pewter might be the one! I like the way it changes color with the light . . . looks really good! Ooh, thanks for the sneak peak of the tile! It looks great so far. Yes, it’s funny what happens when you do one little thing and it snowballs….Every time I get near our pantry and start taking things out of the cabinets my husband gets nervous…. Love the new stencil floor plan – can’t wait to see what y’all pick!! Love the idea of the stenciled floor!! Question. 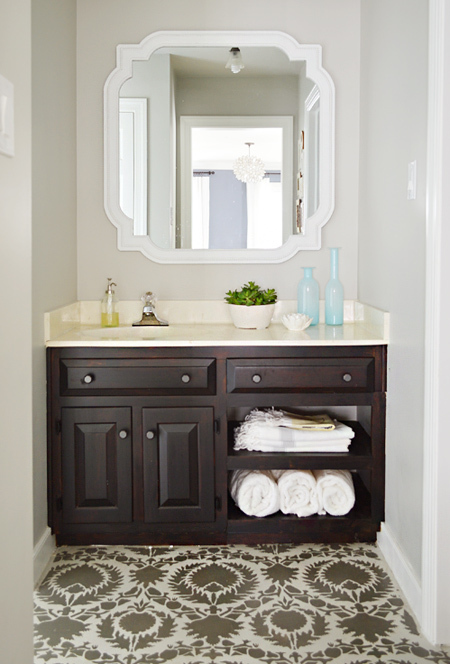 Have you considered taking off the trim pieces from the vanity top the way you did in the last house? I don’t know what kind of material you are working with this time around, but it might help the area feel more updated! As always, you guys are wonderful! Enjoy Columbus Day! Sadly the top and the back piece are all one piece (sort of a curved slab instead of an add-on piece) so while I could take off the side pieces, since the back piece is stuck on there I’m not sure if I’ll attempt it. Although I can’t wait until our true bathroom remodel in a year or two when we get to knock down that wall that separates one tiny sink from this one and actually have a double sink going on! I was just going to ask this question. Glad I saw it in the comments already! Love the color. I’m sure all that cutting-in was so tedious, but the new paint makes such a difference! I like that you chose Revere Gray. We used a similar gray-taupe-constantly-changing neutral color in our living room, office, and bedroom called Herbal Escape. It warms up the rooms without being too distracting. Nice job! Yes I hate old yellow outlets! We have about 50. Is there a tutorial post on that somewhere? Does someone mind directing me? Thanks! I don’t think we’ve ever done a step by step tutorial on that (when the power is off, it’s usually pretty hard to take photos unless we’re in a super sunny spot) but if there’s ever an opportunity we’d love to! Maybe check youtube.com to see if they have a video on it? Oh my gosh you’re right! I forgot about that one-giant-image post that John did! Hope it helps! And thanks for the link Alex! I just recently painted my living room, kitchen, and baby girl’s nursery this color, and I love it! It looks great in your space, too. Pinterest tells no lies! Dang you, Petersiks! lol… I was SO set on Revere Pewter and at the last minute I worried it was too beige so I went with Gray Horse for the ENTIRE main floor. (It’s one darker on the Moonshine strip). But your walls look BEAUTIFUL! I actually find that my walls now look blue in many lights, go figure. Oh well, live and learn – the house is coming along splendidly, great job! Oh but we LOVE Gray Horse! That was the color under the railing in our last house’s office and it was so pretty!! Love the color you chose – very restful. It’s such a bummer when the weather gets in the way! We had a wet weekend too which literally put a damper on my spray-painting. Love the new wall colour, though. I’m tending towards shades of a similar gray throughout our house. 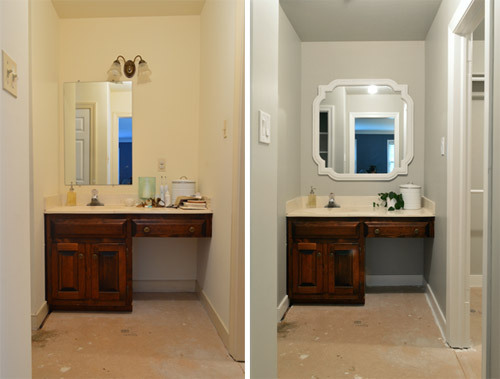 I just get a kick out of the “Before” pic with that weird 1/2 mirror…it looks so much better already, and I love the idea of the stenciled floor! Can’t wait to see the outside once it’s completed…it looks great already! This had me cracking up!! So great! And dudes, I LOVE the new floor idea! I was sad to read that the blue vanity was out … until I saw the flooring idea! SO excited if that’s where you guys end up! The sunroom tile already looks amazing! Who needs grout anyway? Thanks for the review on “Reverie Pewter”. I’ve also seen it a lot on Pinterest. I’ve been out of the loop for a few days so it’s fun catching up and seeing what all you have been up to. 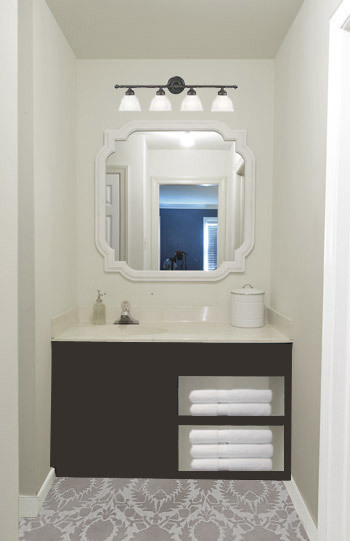 I love the idea of adding shelves to the vanity to balance it out. I was actually thinking the same thing before I saw your comment on it. Color is great! And the stenciled floor idea is exciting! Can’t wait to see it. I love all this paint color validation I keep getting from YHL! 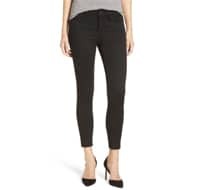 ;D First, it was Edgecomb Gray, which last spring/summer became our main/throughout most of the house color. Now, it’s Revere Pewter, which in the same time period became our new foyer color! The two actually kiss at an inside corner leading from the foyer to the stairwell. And, I agree – RP is like a slightly darker, grayer EG. (They are one above the over on my BM color fan). 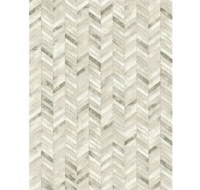 Love it, looks great in your master bath! Thanks Sarah! Sounds so pretty next to EG! We’re thinking about using RP on the ceiling in the foyer to add drama to those EG walls! Do you have a timeline for the master bathroom? We are always hesitant to do an “interim” makeover because we end up spending more money in the end. Do you think you’ll wait a few years before doing the “actual” reno of that space? Yes, it’ll probably be at least a year or two since it involves knocking down a wall, retiling, reconfiguring, etc. We actually got a reader question about the whole interim process so we have that post in the hopper for ya this week! I’ve always been confused about this also. Even the mirror alone I couldn’t wrap my head around. Maybe we’re just super cheap, but it seems like a lot of money (and painting time! ugh! )for something you’ll just rip out next year. Kinda seems like you just need a blog post to fill the time? I’m sure it’s a belt, but I totally thought John was rocking a beeper in his pocket. Hilarious! Oh beepers. We should bring those back! And I hope that post in the hopper will help explain things for you, Avone! We definitely have ten million other projects to do here, so we wouldn’t waste time on anything “just for a blog post” when we could be painting more blue trim and peeling more wallpaper – haha! We’ve just been doing Phase 1 stuff like this since our first house (we painted the kitchen cabinets and added peel & stick tile to the floor so we could enjoy that room for a few years before gutting it). And as for the mirror, we won’t just toss it! We’ll either hang it in another area of the bathroom (over the tub or a storage cabinet for example) or find another spot in our house for it. 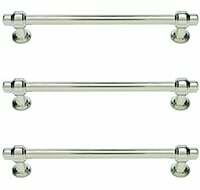 A lot of our accessories move from room to room, so they’re nice and flexible – which makes us feel like we’re getting our money’s worth! Aw, sorry Katie Rose! It’s business as usual for us as well (we have two meetings and two posts on schedule for today). We hear that Canadians have it off for their version of Thanksgiving! Lucky, eh?! Canadian thanksgiving was this weekend. It was our/my first taste of turkey since Easter. Mmmm…I love turkey and stuffing and mashed potatoes and gravy. Oh the gravy. I didn’t think I would be hungry for a week and here I am drooling about it already. Thanks for being so honest about time! Things happen and projects take longer than planned and I love that about y’all ! Oh how I heart Revere Pewter – such a beautifully versatile color! 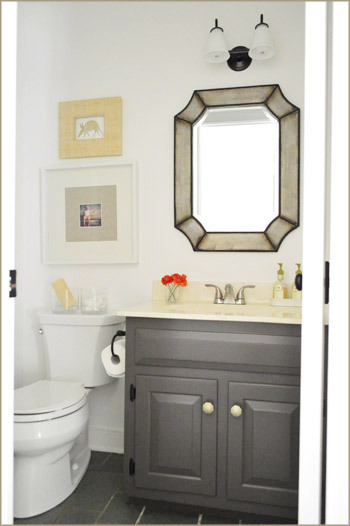 I just used it on a client bathroom, and I rehabbed the vanity as well, in “Gray” by Benjamin Moore (which is AWESOME, btw). So charming! LOVE that rug by the way! You’re not alone. I can verbally say “revere”, but in my head it’s “ra-veer-a”. Do they still sell Hooked On Phonics? Being from Massachusetts, I find it impossible to say Revere without throwing in the southie accent. Even though I’m not from southie… and therefore a total poser. :D But it is irresistible! Wow, that paint really makes a huge difference, it is looking so nice! I really dig the idea of the floor stencil so looking forward to seeing how that comes out. I recently made the “it’ll be fast and easy” mistake with a paint job and ended up spending hours taking hidden wallpaper down. Oh well, it just means you enjoy the finished product that much more! Y’all are seriously going to spend the next 2 years walking barefoot on a plywood subfloor in a bathroom? There’s water splashing around in there every day. All it takes is an unexpected crack developing in an older toilet tank. I had that happen once, and missed it because the crack was on the bottom of the tank, perfectly positioned above a wastebasket tucked into the corner against the wall. So the water dripped into that until it overflowed, all day long when no one was home to catch it, and did a wide splotch of damage on the kitchen ceiling below as well as the bathroom floor. And that floor had – unbeknownst to me – hardwood (1920s-era home) with 3 layers of ancient linoleum beneath the final layer. So I’d be leery about just plywood in case of an unanticipated flood. You can’t tell when a toilet tank is about to go south on you, and your bathroom is attached to the master closet where for sure you’ll have items on the floor. What room is under that bathroom? Sorry to be unclear! If you check out our house tour page you’ll see the area of the bathroom with the toilet, tub, and second sink is tiled. This is just a vanity (second sink area) that’s located off of the bedroom for people who want to take off makeup/take out contact/brush their teeth before bed. Its looking fabulous. Love that the yellowy creaming color is gone in the bathroom! If it doesn’t stop raining, the next big project might be John building an ark! We live in the same area as you guys and while we needed rain, I think someone forgot to turn off the faucets. BTW… love the tile on the sunroom. Seriously! We need the sun! I’m doing a rain dance for you right now! I love the stenciled floor idea. I think y’all will love it so much you’ll leave it like that forever. Can’t wait to see the finished sunroom!! I like idea #2 much better than idea #1. Especially because, why not go wild on the floor!? Its just temporary anyway, so its the perfect opportunity to do something crazy you might be scared to do on a “forever” floor. Oh yeah, we can’t wait until the sun comes out again and we can update pics! I noticed that the carpet left a gap between the bottom of the door frames and the subfloor. If you choose to pick a floor that isn’t as thick as the carpet was, how will you compensate for the space left open at the bottom of the door frame? Lower the entire door frame, fill it in with small pieces of framing? We’re about to have this problem in our dining room/hallway when we replace the flooring, so I’m curious as to how you plan to tackle this. Thanks for the help! Happy Monday! I think we’d just try to build it up with something like two layers of cement board under the tile we’ll eventually add or something. It’s nice not have have small steps up and down if you can help it! Oh I have to weigh in on this one! We just recently resurfaced our counter tops with Rustoleum’s counter paint. $20 later it’s gone from orange [I know, WHAT.] to pewter. It takes 3 days to cure but I cannot sing it’s praises ENOUGH. Maybe you could use it a s a cheapie solution to the yellow counter in the bathroom? Oh, wait. Sherry’s pregnant and this stuff is very very not no-VOC. NEVERMIND… Unless you have John do it and y’all take a nice vacation. Never enough vacations!! Yeah, that’s my only hangup! I wish they made that stuff VOC free! By the time the kids are 10 and 14 I bet they will, haha! 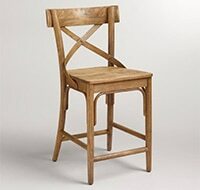 The people who owned our house before us used this, and I have been very unhappy with it. I found that if I use my homemade, vinegar-based cleaner on it the speckled part disappears (as in I don’t see the speckles on my wash cloth). The paint has also chipped in some places. I don’t know if it was poor application or what, but it just has not worked well for us. I look forward to getting new counter tops in a year or two. Interesting! Anyone else have reviews on this type of product? I wonder if it has gotten better in formula over time? Your paint color and ideas are super gorgeous, but just had a question: If your future plans are to tile the floor somewhere down the line, do you really want to go through the time and pain of stenciling the wood floor? I remember at your last house, poor Sherry said her hand felt like a claw. Oh yes, for the book we learned that a foam roller worked for stenciling! So I’m such a fool to have done that all by hand in the office, but now I know I can knock out the floor a lot faster. We did a wall for the book in about 2 hours, which is totally one of those “worth it” time investments for loving something for a year or two while we save up for the major reno! a 1970s nightmare in some rooms. I read here every day and love watching your progress! Love the progress! I also liked that you painted the ceiling. Our builder painted all of our ceilings the same color as the walls…what’s your take on having the ceiling one color (macadamia – SW) and the walls another? We painted our half bath (sea salt – SW) and left the ceiling macadamia…I can’t decide….Thanks! We like contrasting ceilings too (just a tone lighter than the walls or even a soft color like a light blue ceiling in a gray or tan room). I think it’ll look great! I painted a hall Revere Pewter this weekend! It’s also in my bedroom and I love it. BM store recommended it to me. It connects to a wall that’s Moonshine which I thought might be weird but it’s ok.
Good timing because I was going to pick a white to do the trim today but now I can just use your pick! I assume it’s a BM color, right? Yes! And that’s so funny about Moonshine, I bet those will look great! I’m obsessed with revere pewter! I painted my living room and hallway that shade after seeing it on Pinterest as well and it definitely didn’t disappoint. Have used Palladian blue too- Benjamin Moore knows what’s up when it comes to colors! I love myself a stencil ;) so am thrilled to hear about your floor project. That’ll look awesome! I just stenciled a wall in our new (old) house and will be doing our stairs. One tip- use a paint roller not a brush! Goes so much faster and looks great. (I still used a brush though at the end of each stencil just to get in the corners.) I started with only a brush and thought my arm was going to fall off! What design are you going to use? 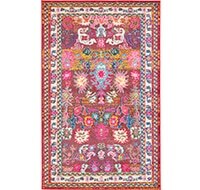 I went with a large scale Moroccan stencil from Royal Designs. Love their stencils. I also found the level from Cutting Edge Stencils to be invaluable if you do decide to stencil any walls. 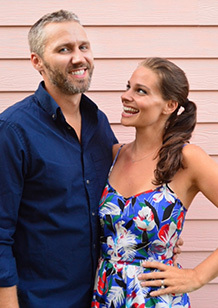 Your house is looking so great- you guys seem like a really great marriage team which is inspirational. Yes, we learned that for the book! Did a whole wall with a small foam roller about 10 times faster than the way I stippled it by hand in the office! Oh man, wish I knew that beforehand! I think we love the stencil we chose for the rendering but we’re not 100% sure what we’ll go with! I love how clean it looks already…I am jealous of the beautiful houses you have there! In Nevada, it seems as if everything that is old is small and if it is new it is stucco! Just wanted to ask if you guys were going to do any additional floor prep before you paint… We actually have a painted floor in our kitchen right now because of a similar ‘we hate this floor but can’t afford to doing something really awesome yet’ situation. heh. We tore up the old cracked tile and instead of finding hardwood like we hoped, we found plywood subflooring. But, 2 coats of porch primer, 3 coats of deep brick red paint, a subtle lighter red stencil on top, and 2 coats of polyurethane later, I love it! I’m going to have trouble changing it now actually. I really like how much color it adds to the room, and the lighter red stencil on the dark red floor is a great layer without screaming STENCIL! in your face. All that to say, I wish we had done a little more priming on the nail heads in the plywood because they show through a bit if you look in the right light. So if you have visible nail heads hit them with a lot of primer! We’re planning to do some patching and some primer and just hope that it sticks. You can poly it for sure to give it added protection too! Thanks for the tip about the nail heads – I hope the primer step covers that for us, but we’ll keep you posted. 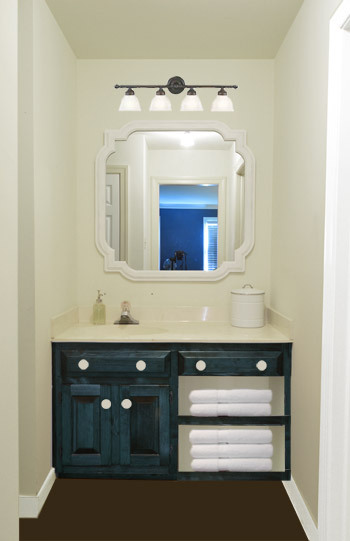 I totally see where you are going with the darker/more subdued vanity, given the counter top, but I still love the idea of the blue stained vanity! 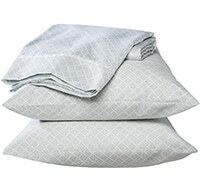 It would go so well with the Revere Pewter and the Black Pepper in the bedroom. This is looks great! I can’t wait to see what you do with the vanity and floor. This is a random question. How thick is your trim around your doors in your bathroom. 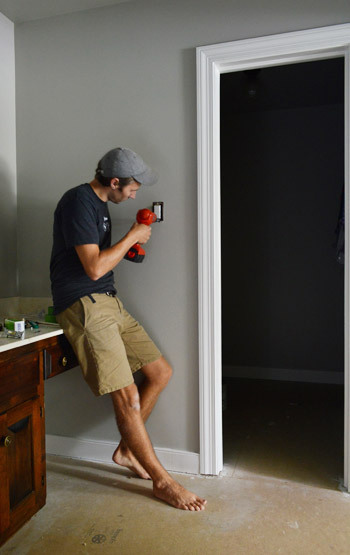 I am looking at upgrading my baseboard to something thicker like yours and I am trying to feel out if I need to change out the trim around the door as well to make it feel balanced. Yours looks great so I figured if my trim around the doors were the same it will look great! Ours is 3 and a quarter inches around those doors. Hope it helps Jan! I am loving your approach of “This is what we want to do with this space for now and when we do these things then this interim-phase is complete”. Major reno in planning stages. A lot of people need to do their projects in phases – save up some funds, plan for major remodel, etc. You are giving us a great example of how you can have a beautiful space in the interim for not so much cash. 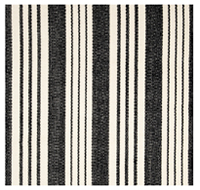 Love the last Photoshop rendering – beautiful stenciled floor – great look without the hefty price tag. A tricked-out walk-in closet would make for a great post! Love these updates! Looking good! I can’t wait to see the stenciled floor!!! 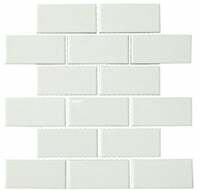 The Photoshop picture kinda reminds me of mosaic cement tile, which I’ve been dreaming of installing in a bathroom (sort of like this http://www.villalagoontile.com/nuevo-castillo-cuban-tropical-tile.html). Ooh, revere pewter! I knew your color palette was not anything fixed, but I really didn’t expect you to pick it! That’s one of my top fave colors, and it’s also our bedroom color. Terrific neutral, isn’t it? With a lot of lighting, it comes out very crisp yet nuanced. 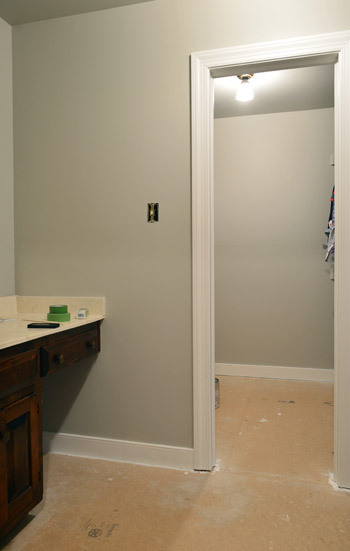 Your new master bath/closet looks great. Everything looks great as usual! Just add sun to the sunroom and it’s done! Your work ethic is inspiring! Now I will take your rain please to Long Island because my yard is a dust bowl, k thanks. Sending lots of rainy thoughts your way!